Welcome to the Page Dental Group, where Dr. Lynette Page and Dr. Rick G. Miller run a comprehensive dental office for the whole family on Upper Greenville, East Dallas. Our dentists and team are thorough and consistent in all they do, from endodontics to oral surgery to pediatric dentistry. We feel we have a responsibility to provide complete dental care, and we do so by offering the latest in dentistry such as Invisalign®, digital x-rays and sedation options that suit you. There are many reasons to use the Page Dental practice. Some of the benefits are on-time appointments, competitive pricing, convenient parking, financial plans, and state-of-the-art dentistry. Our practice has proudly provided quality dentistry for 30 years with patients coming from Preston Hollow, White Rock and from across East Dallas. And Our goal is to serve all of our patients with first class dental treatments. Whatever your age or circumstance and whenever you visit; we work hard to deliver that special level of dental care. 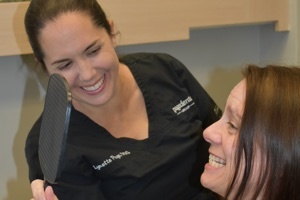 Dr. Lynette Page is an award-winning dentist having attained Fellowship in the Academy of General Dentistry (FAGD) – a distinction awarded to only 7% of dentists nationwide. We create beautiful smiles with the latest dental treatments and techniques – both general and cosmetic dentistry. Our team of dentists, their assistants and hygienists are all dedicated to serving you with the best available care. Please call us at (214) 692-7499 or use the online form. Accepted payments are: Cash, Check, Care Credit, American Express, Discover, Mastercard & Visa.